Police are appealing for information after a man and woman in their 20s were hospitalised following an assult by a masked gang during a burglary in Maghera in the early hours of this morning. 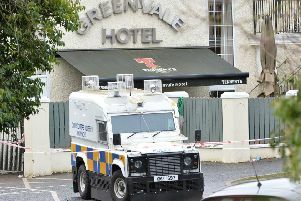 The incident took place in the Oakvale Terrace area of Maghera at approximately 1.10am [Wednesday 25 November]. It is reported that three masked men, armed with baseball bats and a sledgehammer, entered a house. They were said to have assaulted a 24-year-old man and a 21-year-old woman and both were taken to hospital for treatment to their injuries - which are not believed to be life threatening. Detective Inspector Will Tate said: “I would ask anyone with any information about this incident to contact detectives at Cookstown Police Station on the non emergency number 101.